The US in 1977 has its largest trade deficit in recent history (Lawrence, 1978). Asian and European companies are making inroads into US markets with sales of less expensive or higher quality products. Fears abound that this will hurt the US economy. Sound familiar? Trade concerns also were felt in the booming bicycle industry during the early 1970s. Consumers began turning away from American-made bicycles such as Schwinn and began favoring brands from Europe including Raleigh, Peugeot and Motobecane. This all changed in the mid-1970s as Japanese companies began taking advantage of their low-cost and high-quality manufacturing facilities to penetrate US markets (Brown n.d.). Even companies like Schwinn got into the act, importing bicycles from Japan and relabeling them as “Schwinn Quality.” The World Sport and Le Tour models introduced by Schwinn in 1972 were made exclusively in Japan (Crown and Coleman 1996). This was paralleled by the emergence of high-quality component manufacturers including Sun Tour, Araya and Shimano. The Japanese bicycle invasion was in full swing. Right in the middle of this bicycle market transition my wife and I are living in Champaign, Illinois. The year is 1976. I’m attending graduate school at the University of Illinois. I had purchased one of those European bicycles--a Raleigh Record—in 1971. 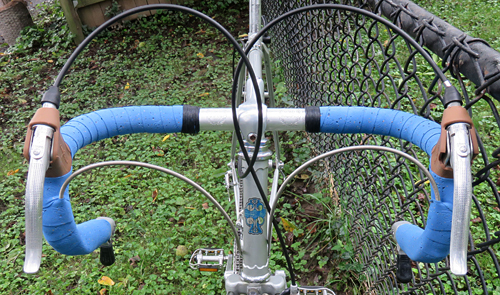 My Raleigh Record was ridden for recreation, exercise and commuting to school. Since arriving in Champaign in 1974 my wife and I had completed two centuries (100 mile bicycle rides) a year and took extended bicycle camping trips during the summers. As a consequence, our Raleighs were accumulating many miles. They were holding up well, but I needed to have two bicycles--one set up for recreational riding and another set up for commuting. We decided to purchase new bicycles that are lighter and suitable for recreational riding and touring. My Raleigh then could be used for commuting to campus. 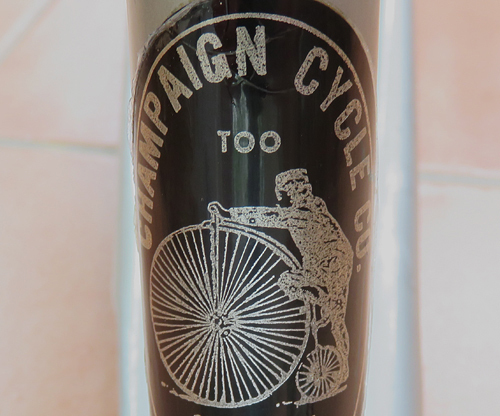 Our next door neighbor in Champaign named Jim was the co-owner Champaign Cycle (figure 1). Jim was a bit younger than us. 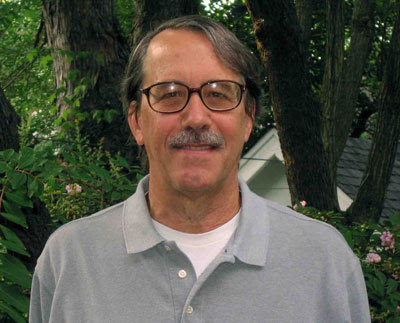 He was not only an avid cyclist, but also was passionate about everything he did. Besides owning the bicycle store, he was studying under a master clockmaker. His days were filled with meshing gears, large ones on bicycles and small ones in clocks. Though Jim and I didn't ride together very often, when I’m out on the road with him, he often slowed down his pace. This was due to both his superior bicycle and conditioning. He liked to kid me about my entry-level Raleigh. "When ya decide to ride a real bike, come ‘n see me." With a mischievous grin, Jim said, "Did ya ever think about custom bicycles? A guy named Bob works in my shop and he’s an amazing welder. He frames're beautiful." Jim knew the purchase of custom, hand-welded bicycles were beyond our reach. He just wanted to tempt us with the best. Jim told me that his employee Bob was leaving his shop in a few months. Jim thought Bob was crazy for leaving a secure job in Champaign for a company with only a handful of employees. He had an offer from shaky, new start-up business in Wisconsin. At the time Japanese bicycles were flooding the American market and most American and European bicycle manufacturers were just starting to move their production to Asia. Jim told me that the new company wanted to build "Made in the USA" bicycles that could compete with the foreign imports. On the surface, this seemed a quixotic venture in an era when foreign imports were replacing American-made bicycles. Jim then mentioned the name of the new Wisconsin startup. To me, it sounded more like a mountaineering or sporting goods company than a bicycle manufacturer. The name of the company was Trek. 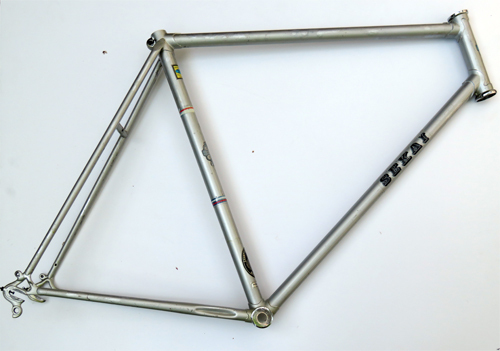 In 1976 Trek had only 5 employees and built about 900 hand-brazed frames. It incorporated in 1977. The company not only eventually would compete with the imports, but would become one of the largest bicycle companies in the world. I never did find out what happened to Bob, but I hope for his sake he stayed with the company. After tempting us with the best, Jim gave us his recommendation. He said, "My store's just introduced a new line of bicycles from a Japanese company called Sekai. They're aggressively pricing high-quality bikes to break into the American market. The wheels’re great. They have nice derailleurs (Sun Tour Cyclone). The frames’re double butted." Double butted steel tubes are thicker at the ends and thinner in the center. This saves weight compared to straight gauge tubing and yet makes the frame joints strong, a place of high stress for bicycles. Then he said with a mischievous grin he says, "The drawback of the Sekais is that you'll never be in as good of shape as you’re in today riding those heavy Raleighs. The bikes’ll set ya back about 200 bucks depending on the model. Stop by the shop and I’ll show ‘em to you." After seeing the bikes later that week I told Jim the size of the Sekais that we wanted to purchase. The deal was done. The following week Jim rang our doorbell. The bikes were ready for us to pick up. We took possession of two Sekai Competition (Model 2500) bicycles (figure 2). Sekai was an ambitious project put together by the owners of a small bicycle store in Seattle, Washington called Velocipede (Gillies n.d.; Freeman n.d.). The owners decided to create high quality bicycles taking advantage of the emerging popularity of Japanese bikes in the US market in the 1970s. The proprietors of Velocipede partnered with Shinwa Trading Company to design the bicycles. Production was farmed out to several factories in Japanese. Sekai bicycles were distributed mostly on the West Coast and in the Midwest. In the early 1970s Sekai sold more bicycles than they could produce. Sekai wasn’t a threat to giants like Schwinn or Raleigh, but they developed a small niche of dedicated riders. They sponsored such bicycle luminaries as Rebecca Twigg (winner of 16 US championships and Olympic Medalist)and Jane Robinson (1974 USA Road Championship winner). 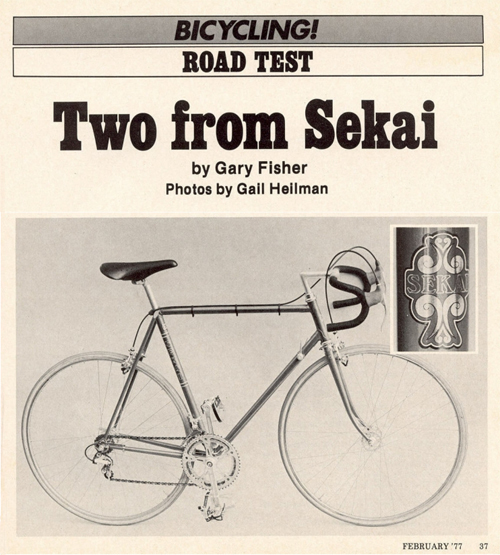 During their heyday, Gary Fisher wrote a 1977 road test article for Bicycling Magazine (figure 3). After reviewing the top of the line model, he focused on the quality of a more reasonably priced model very similar to the Sekais that we purchased. The Sekai story is one of an ambitious bicycle company that was like a shooting star. For a brief period of time Sekai shone brightly in the bicycle sky and sold high-quality machines at reasonable prices. Unfortunately, within a few years Japanese imports gave way to bicycles produced in the factories of Taiwan and eventually China. Sekai along with some other Japanese brands lost their luster. Sekai faded from the US market in the 1980s. With the appreciation of the yen over the dollar in the late 1970s Shinwa trading company decided to break up Sekai. After a short period of time, the Sekai brand was sold to a Canadian bicycle retailer that specialized in selling inexpensive, low-quality bicycles. This spelled an end to the dream of producing quality machines. The bicycle industry was once again making a pivot from producing bicycles in Japan to Taiwan and other countries. My Sekai has been ridden almost continuously since 1976 for exercise and recreation. My 1971 Raleigh has always been my commuting bicycle and I still use it for local riding today. 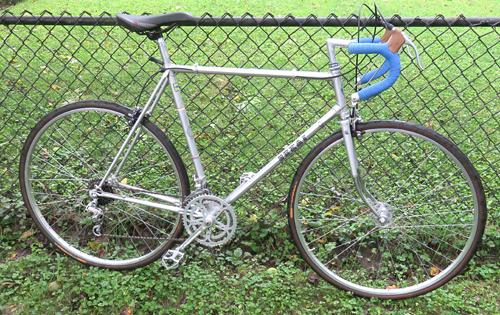 In 2001 I purchased a LeMond Zurich road bike for recreational riding. After that the Sekai was ridden by my son during his teenage years. When my son went to college, I gave him the Sekai. Between 2006 and 2011 the Sekai was his main form of transportation. Attending American University in Washington, DC, Chris rode the bicycle almost every day for commuting back and forth to class. After graduation, he did not ride the Sekai as much, except for occasional short trips and everyday transportation. He is 6’ 2” and the 23” frame was a better fit for someone between 5’ 10” and 6’ tall. The bike was always just a bit too small for him. This past year he took the 1983 Schwinn Le Tour that I rebuilt earlier this year. As a consequence, the well-used Sekai is back in my possession. After years of knocking around on the campus of American University and the streets of Washington DC, the Sekai was dinged, dirty and out of adjustment. It was used almost continuously for 40 years. Walking through downtown DC many beat up vintage bikes commonly are seen chained to bike racks. Bike thieves are sophisticated in Washington, DC and they rarely touch such older bicycles. They know the value of both bicycles and components. I had partially restored the Sekai several times over the years. I decided it was time to restore it to its near original condition. This wouldn't be an easy task. The paint was chipped from being locked to bike racks and traffic signs. The gears were covered with a black tarry grease covering up years of use. The cables were old and frayed. This is not a bicycle that hung on the wall of a garage waiting to be dusted off. It was a working bicycle. On examination, all the parts of the bicycle were still original and in working order. This is a testimony to the original high-quality build of the Sekai bicycles. I decide it’s time to bring the old Sekai back to life. The Sekai components reflect the growing quality of Japanese components in the mid-1970s. The list of components is highlighted in the Bicycling article by Gary Fisher (1977). 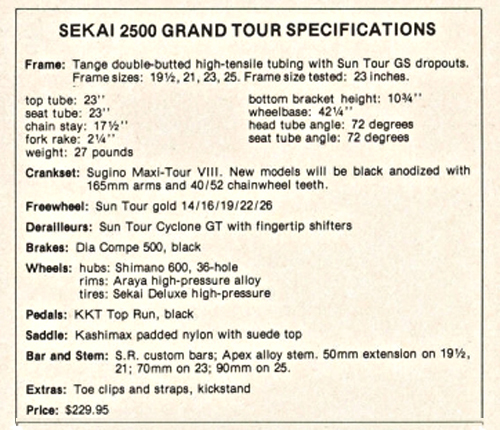 The Grand Tour is the 1977 version of the 1976 Sekai Competition, with the only change being swapping Suzue hubs for ones made by Shimano. 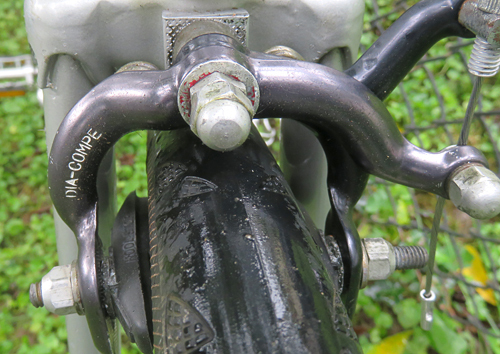 The bicycle had an all Japanese line of components (figure 4). Having the parts manufacturers close to the frame builder no doubt saved time and money in assembling the bicycle. All these components were in good shape and the wheels were still true even after 40 years of rough roads in Illinois and Washington, DC. The hardest part of restoring the Sekai was touching up the frame. The paint on the Sekai did not hold up well to abuse. In several areas it had large round spots where the paint had chipped off the frame and had surface rust. I used an artist paint brush and several thin coats to touch up the frame. Then I covered the frame with two thin coats of clear enamel to finish the job (figure 5). 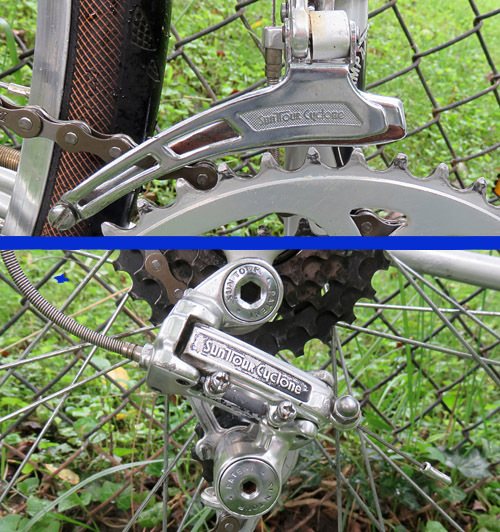 The Sun Tour Cyclone derailleurs on the Sekai were the best Japanese components produced in the 1970s (figure 6). Frank Berto (2017), who is the former technical director for Bicycling Magazine, states that “Cyclone…was the best shifting derailleur on the market.” In combination with the bar end Sun Tour shifters, changing gears on the Sekai is smooth and secure. Unfortunately, these are not index shifters. Sun Tour was late in bringing out index shifters championed by Shimano and this caused their demise as a component manufacturer. Sun Tour quit producing these derailleurs after being challenged by Shimano. However, for a while Sun Tour was the ranked as the best shifting derailleurs on the market. The Dia-Compe shifters never have a problem with centering compared to other shifters popular during the 1970s (figure 7). This eliminated the problems encountered with center pull brakes that were difficult to adjust. The brakes also provide a smooth braking experience and rarely come out of adjustment. The front end of the Sekai is a combination of Sakai Custom Road Champion alloy handlebars and SR forged alloy stems (figure 8). The brake levers are Dia-Compe and they basically are the Japanese version of the popular Weinman brakes available on almost all bikes at the time. There was a good reason for this. Weinmann had quit developing new products and it actually had a licensing agreement with Dia-Compe to design some of their brakes. The chainring and crankset on the Sekai are made by Sugino (figure 9). 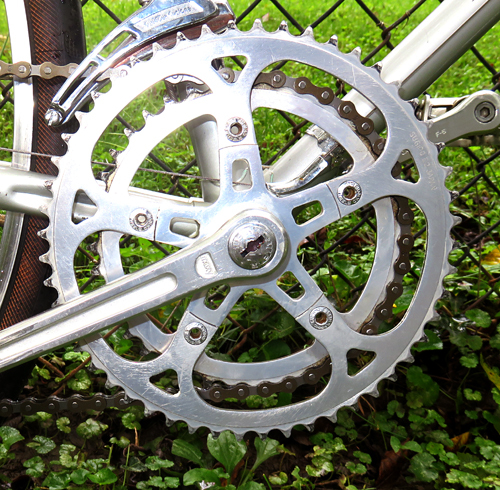 The chainring is still as straight today as when I purchased the bike in 1976. After 40 years of riding the bicycle, the bottom bracket cups were worn, and I replaced them in this rebuild of the Sekai. The rims on the bicycle are made by Araya and they were quite popular on road bikes in the 1970s and 1980s (figure 10). These are medium quality rims and they have held up very well. The wheel hasn't required much truing over the years. The well-made hubs are made by Suzue. Suzue first started manufacturing iron hubs in 1952 and in 1976 developed alloy hub sets for road bikes. Araya has been making rims for over 100 years and Suzue is still making hubs today. On a smaller scale, Sekai Japanese bicycles shared a similar fate as the American-made Schwinn. They fell victim to the competition in an increasing globalized world. Sekai faltered due to the shift of the production of bicycles from Japan to Taiwan and China. In another parallel, the Schwinn name eventually ended up being purchased by a Canadian bicycle mass marketing company called Pacific Cycle, a subsidiary of Dorel Industries. Sekai suffered a similar fate, but without the prestige of a big name, the company was closed. To its credit Schwinn did try to compete in a globalized world. It shifted some production to Japan and then Taiwan and finally China. However, with an aging factory in Chicago and a disastrous venture into manufacturing bicycles in the Mississippi, the family company sold Schwinn and its proprietary name in 1992. 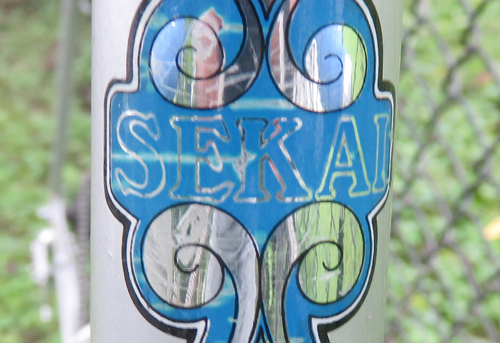 Sekai would cease to be a bicycle brand in the 1980s. Sekai would have become a forgotten blip in the bicycle industry if their bicycles didn’t last so long. Because Sekais were well built and have a comfortable ride, the name Sekai lives on today in commuter specials. May my refurbished 1977 Sekai Competition last another 40 years. Berto, Frank. 2017. The Dancing Chain: History and Development of the Derailleur Bicycle. 5th edition. San Francisco: Cycle Publishing. Brown, Sheldon. n.d. “Japanese Bicycles in the U.S. Market.” Sheldon Brown’s Technical Bicycle Information Website. Accessed 2018. Fisher, Gary. 1977. “Two from Sekai.” Bicycling Magazine. February. Freeman, Robert. n.d.. “Classic Rendezvous: Sekai.” Classic Rendezvous Website. Accessed 2018. Gillies, Don. n.d. “Sekai Valuation.” Don Gillies Website. Accessed 2018. Lawrence, Robert. 1978. “An Analysis of the US Trade Deficit in 1977.” Brookings Papers on Economic Activity, Brookings Institution. 1:1978. Muzzi, Andrew. n.d. “Sekai Bicycle.” Yellow Jersey Website. Accessed 2018.